It seems like your cool rails application is ready to go wild, That’s great! sooner the better. Before you made up your mind for deploying rails application to a VPS – you should know that it’s not a very easy (and only) process. You could have deployed using some other way e.g Heroku, probably much faster. Manually deploying your rails application to a VPS can be very frustrating for beginners but if you’re willing to learn all those stuffs (GNU/Linux, terminal commands, server administration stuffs and more) or may be you want full control over the things – then probably you made the best choice. If you don’t already own a VPS then buy one. I recommend Linode (I’ve been using it for my blog as well as for other rails applications, I absolutely love their service). They’ve plans starting at $20/month for 512MB 1024MB 2048 RAM. (which should be sufficient for testing and launch, you can upgrade easily so start with small one, unless you’re sure how much memory you need). Another Great Option – Digital Ocean (starting @$5/mo, 20 GB SSD, 1TB Data, 512 MB RAM, free backups and more!) You can use promo code DEPLOY2DO to get $10 credit (worth two months of free hosting), so you can give it a try without any risk. I’ve written more about it recently – Digital Ocean Hosting Review. After getting a VPS ready (usually within few minutes), choose an operating system – I recommend Ubuntu (unless you’ve some specific choice, due to some previous experience with a GNU/Linux distribution such as ArchLinux, Debian etc) – select latest LTS release, ie Ubuntu 12.04 LTS (precise pangolin). Update! Now, Ubuntu 14.04 LTS is out and available. So, you should choose that. You may need to change few commands below. Although, if you go with 12.04, you can always upgrade. When, the vps is ready (within few minutes, after you deploy and boot the server), SSH into the server and use your root account to login (you would get the root password from vps provider’s panel, while deploying the OS, in the above step #1). Now, first update the repository cache and the packages. Using root account is not a good idea (of course for security reasons, that’s why there is something called sudo, that would allow you to execute commands with root privilages). So lets create a user, e.g mrhuman, add him to sudo group (so that he can execute commands with root power). Using password authentication is not secure and it’s also not very efficient. Logout from the current session or switch to the newly created user with su user_name command. In next step, we will be setting up the ssh-authentication. If you’ve not already generated public/private keys (most likely you already have a pair of public/private keys, e.g you might have generated it for github or bitbucket), then generate one and upload your public key to the vps server. In this guide I assume you’re using nginx server, Apache is another great option. Before installing nginx, first install the utility – python-software-properties, for installing packages via PPA, sometimes the packages available in repository are very outdated. Then install nginx from the PPA. to start the nginx and visit the IP address your server, you should see the default page there. For managing ruby versions you should choose RVM or rbenv. In this guide I’m going with rbenv. After installing rbenv, Just add the following lines to the top of your ~/.bashrc file. I assume you’re using MySQL in production (or whatver like Postgresql, MongoDB etc, you need to install the required packages/dependenices and create database/user). Now, it’s time to set up capistrano for automating the deployment process. You would also need to have the source code hosted on a private repository (unless you want the source code to be available public) such as on github or bitbucket and add the remote repository to list of identified hosts (to avoid some error during deployment). Simply, ssh into the remote host (remote repository) e.g ssh github.com or ssh bitbucket.org(if you’re using bitbucket) from the remote server. add following gems into your Gemfile. and install those gems, by running bundle install. Then, update database.yml file (!warning, you shouldn’t put this kind of file in git repository). Next, add unicorn.rb and unicorn_init.sh (make it executable by running chmod +x unicorn_init.sh) file to config directory. That’s all, now it’s time to deploy! I assume you’re already using git, so commit the latest changes and push it to master branch. git commit -am "add deployment configs"
Run the database migrations and start. 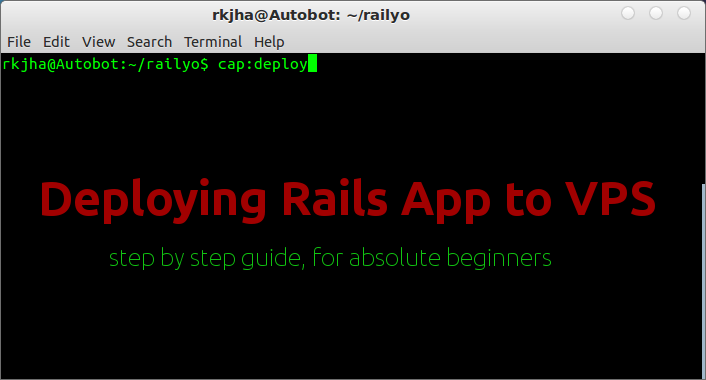 Now, Your Rails app should be running fine, any problem? Drop a comment here, we’ll look into that. 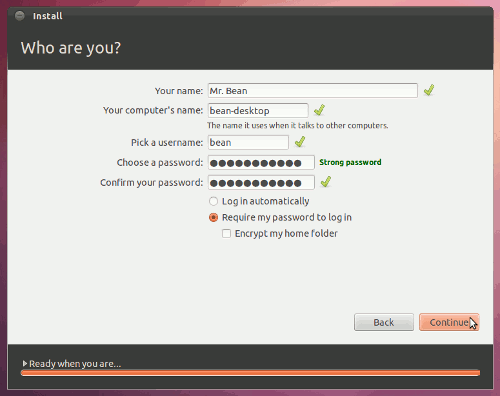 Ubuntu 11.10 (code named as Oneiric Ocelot) beta 1 has released and final (stable version of 11.10) released a week ago. 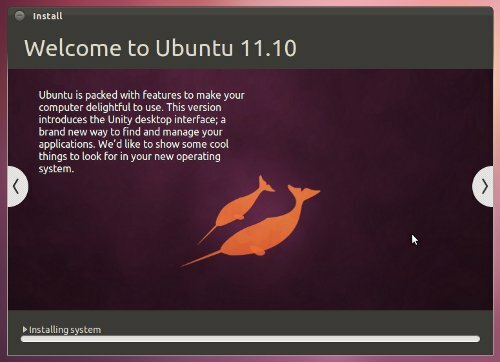 If you’re a absolute beginner – i.e you’ve very little (negligible) or no experience with Linux distributions then this post might help you in getting started with Ubuntu as it contains step by step instruction for installing Ubuntu 11.10 on your Desktop/Laptop/Netbook. The instructions given in this post assume that you want to install ubuntu as a dual boot with Windows 7 (or XP/Vista or whatever you’ve already installed), which is recommended for absolute beginners as if any problem occurs with Ubuntu (or you are not feeling comfortable with Ubuntu, although that’s not probably going to happen) then still you would be able to access Windows, but if you want something else like – removing windows and install Ubuntu or erase whole disk and install Ubuntu on a new computer – then most of the steps would be same – few things will change that I’ve pointed out (Jump to steps). 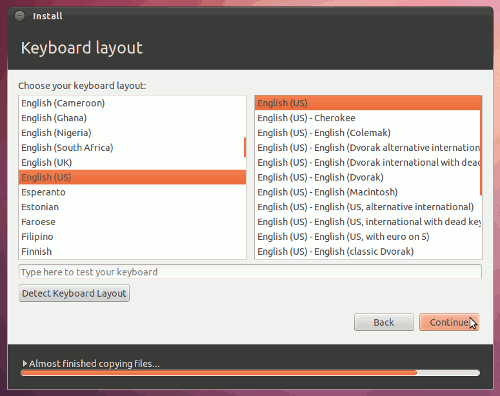 Ubuntu 11.10 beta 1 has released with a lot of surprises/changes, new features and some improvements in the unity desktop. One of the biggest change is that Ubuntu 11.10 uses Gnome 3, unity also uses Gnome 3 so it means you can install gnome shell on ubuntu 11.10 – in few steps without breaking the unity i.e it will support Gnome 3 without any problem. (although there may be some bugs right now as it’s beta release). Ubuntu 11.10 can be installed in many ways – one of the easiest method is using wubi installer, but it doesn’t provide much control options so we would go with advanced installation..and one more thing – it’s not as difficult as it appears to be, just follow the instructions – if you’ve any doubt then drop a comment. Before going to start the installation procedure – you are strongly recommended to backup your data (using a backup disk or online backup program), although you aren’t going to loose any if you’ve multiple partition on your drive and want to go for custom installation procedure, but you’re supposed to have a backup of all your critical data before starting any experiments. First, Download Ubuntu 11.10 ISO , select the archive file (ISO) depending on your computer architecture – such as Intelx86 or AMD64. If you are not sure then go for first one. When the download is complete move on to next step. Then create a bootable USB stick/drive or a CD/DVD from the ISO file you’ve just downloaded. If you want to create a bootable CD/DVD – then it’s pretty easy- you just need to burn the ISO image to the cd. If you are using windows now then use the free program called – universal USB installer. To make your pendrive bootable – use Universal-USB-Installer (Download and run it – then locate the ISO file, choose your USB drive as a target and your will be done in a minute). In Windows 7 you can burn ISO files directly in few simple steps – Insert cd in to the tray, right click on the ISO file and select burn this ISO.. and finally you will get a bootable cd. There is a program called – ‘Start Up Disk creator’ is installed by default on Ubuntu. So just run the program – browse the ISO and select your pendrive/cd as the target startup disk. That’s All. In the and of step 2 you will get a bootable media – which is also called as Live CD/USB Installer (this is also very useful for removing viruses from Windows or recovering data from corrupted OS, as you don’t need to enter any password (exception : BIOS password) when your boot your computer using this live cd/usb), Now we will boot the computer from this bootable disk and finally we will install it permanently into the hard drive. Now restart your computer (and enter your supervisor BIOS passsword, if you have set any password – you system may not boot from CD if you enter user BIOS password). 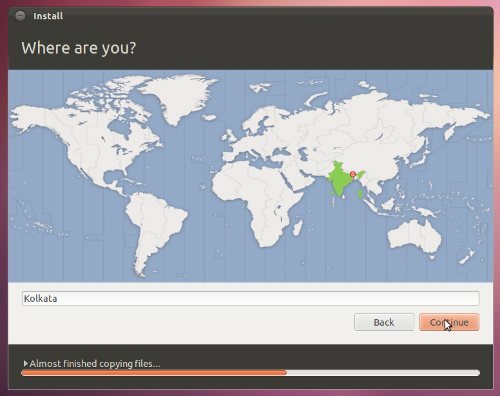 Your computer should boot automatically from the bootable media, and the Ubuntu will be loaded in RAM (if any option comes then select ‘try Ubuntu without installing if you want to take a look before installing it on your hard drive’). 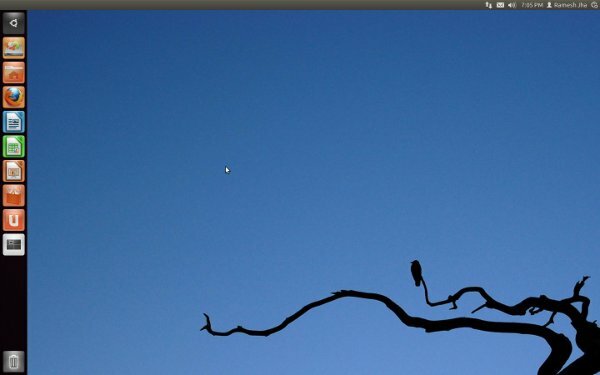 Then click on the install Ubuntu 11.10 icon on the desktop to begin. Now select the check boxes such as ‘Download Updates’ and ‘install third party software’, but you must be connected with Internet (it’s recommended – if wireless network doesn’t seem to work use wired connection). Although there is no hurry – you can always install them later, so it’s optional. then click on continue – then a new window will appear – where you need to select installation type. 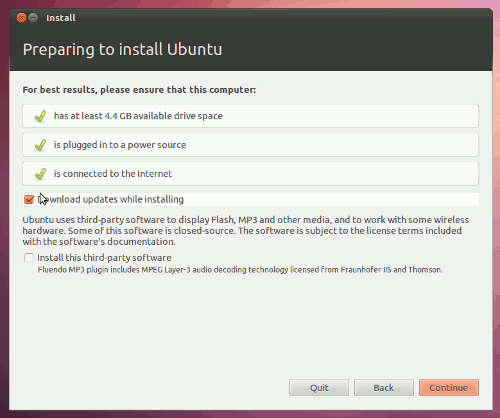 Install Ubuntu alongside with them : it will install Ubuntu 11.10 alongside with existing operating systems such as Windows 7. Erase Entire Disk and Install Ubuntu : it’s going to erase your whole hard drive and everything will be deleted (your files as well as other operating systems), useful only if your hard-drive doesn’t have any important files or you just bought a new computer and want to keep only one OS – i.e Ubuntu. 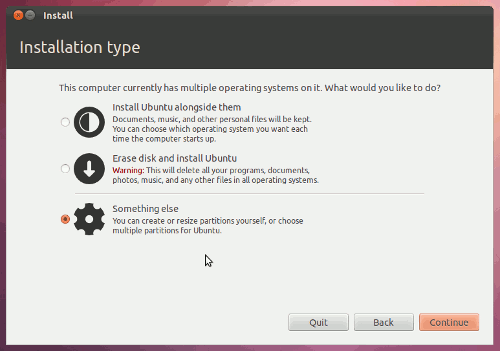 Something Else : Create, Allocate and choose the partition to which you want to install Ubuntu, using advanced partition manager. At first look it may seems little difficult but it’s better as it give you more options/control. We will go with the third option – select Something else and continue. In the end of step 4, you will get the partition manager window for creating/deleting partitions. Then select the free space available for creating partition (if you don’t have any free space then try deleting any empty NTFS drive or the partition whose files has been backed up completely). Now select the partition which says – ‘free space’ and click on ‘New Partition Table’. 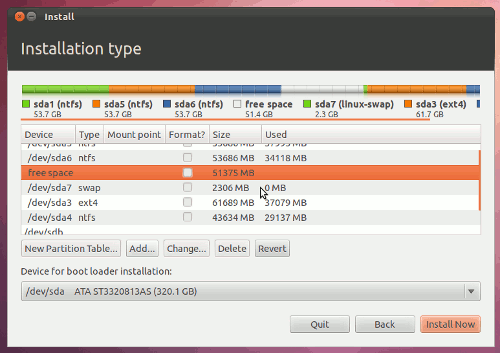 New Partition Size : The size of the partition (in megabytes) where you are going to install ubuntu 11.10.Recommended minimum size is 15 GB, if you want to use it for daily purpose, although 5GB (or may be less) is critically required. I’ve left it default as I want to use all that selected free space partition (around 51GB). 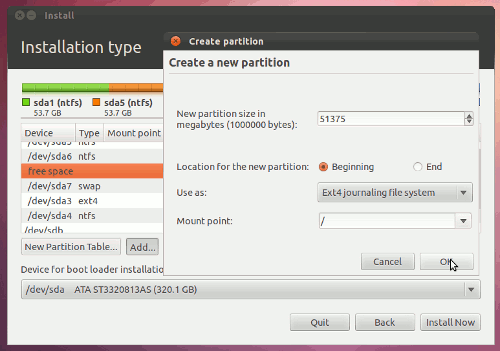 Location for the New Partition : beginning (if you want it to appear on the top in grub menu (when the system starts) – default OS ) or end (if you want the Ubuntu 11.10 to appear at the end in OS list at GRUB). Don’t worry you can change the default OS later. Let’s choose Beginning. 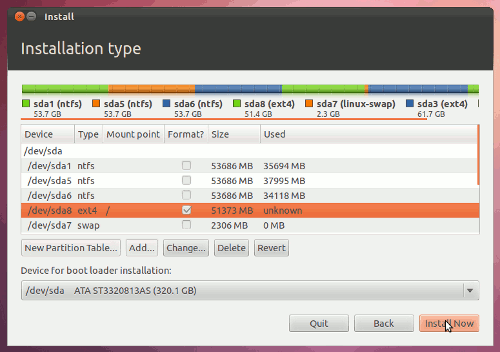 File System (use as) – select Ext4 journaling file system , the latest and recommended files system for Ubuntu 11.10. Mount Point – select / (forward slash), it’s used to mount additional file systems, forward slash means – mounting is done with reference to root. Then click OK to apply. Next, click on Install Now button to begin installation procedure. Your Physical Location – it will be used to set your local time and other settings. Select it on world Map. Keyboard Layout – Leave it default if you aren’t sure or select the one you want to use. Require my password to login : better leave this option selected if you want authorized access (unless you aren’t using BIOS password) to your computer, else you can also choose the other option – login automatically. Now the installation procedure will complete within few minutes. 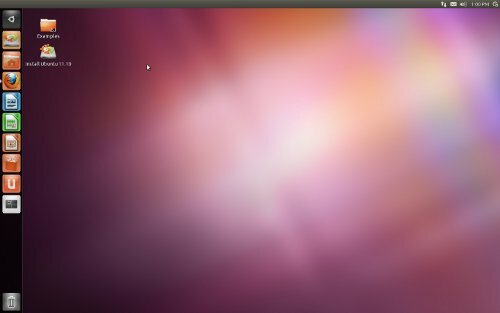 Now when you see a window saying installation is complete – restart your computer and remove the installation media and select Ubuntu 11.10 at the boot menu, and login to ubuntu. That’s All..Now it’s time for installing some basic applications – 10 things to do after installing Ubuntu 11.10, for performing some common tasks. Update1 : Added a video explaining how to install Ubuntu 11.10, although steps aren’t exactly same as described above but it might help you.